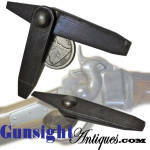 This H. M. Hall’s Combination Sewing Machine Attachment is complete, and unused just as it came from the stock of a mid 19th century country store. The just post Civil War Pat. 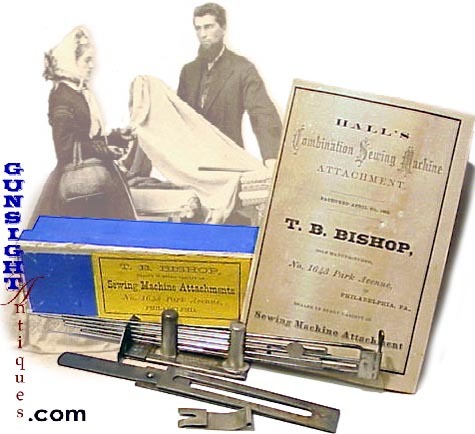 April 6, 1869 attachment was manufactured by T. B. Bishop of Philadelphia and remains in the original manufacturer’s labeled 6 ¼" long pasteboard box with multi page instruction folder . The instruction sheet boasts that the wonder guides the work without HELP from the operator to a great extent, leaving the hands and eyes to their ease further that It requires no Basting of the work. Instructions are offered for sewing two or more pieces in one Seam – to put Staying on the edge of the Seam – to make a Seam for Felling – to put on Braid & Binding – Hemming – Gathering & Ruffling – Tucking & Marking – Quilting - and more ! It appears by the instructions the attachment was designed for use on any machine of the period making this little gem a neat accessory to set with any Civil War era sewing machine.